The latest statistics by the Student Loans Company shows that outstanding student loan debt is over 100 billion pounds. The UK government expects debt levels to rise to 500 billion pounds in the next 13 years and eventually reach 1 trillion pounds by 2040. Yet, Data from the 2016-17 period shows that only 11% of all borrowers managed to pay back their student debt in that year. Even so, students are taking more loans out than ever before, in 2015, 92% of all eligible students were taking loans. As bigger and bigger sums of money become increasingly accessible, is it even possible for students to leave university without debt? Let’s start by looking at what it costs to go to university in the UK. The Reddin Survey of University tuition fees found that for the academic year of 2016 – 2017, the average undergraduate tuition fees for home students was around 9000 pounds. Additionally, An estimate by the University of Edinburgh puts monthly student living costs at a modest 655 pounds, but it can easily reach up to 1,340 pounds, or even more. Based on the more modest estimate, a basic standard of living will cost you 7,860 pounds per year. Now, let’s say you manage to Work an 8 hour minimum wage job  – this will earn you 7.50 pounds an hour, or 60 pounds per day which is around 1200 pounds per month assuming you work for 20 days per month. That’s a pretty solid 14,400 pound yearly salary, but with no expense for entertainment and leisure, and all the money spent on living costs, you will only have 6540 pounds left over. Oh wait, we we forgot about taxes, National Insurance and so on – so infact, you get almost nothing. So you’re working 8 hours a day and only spending on necessities, yet still unable to afford an undergraduate course at university. So it seems inevitable to be leaving university with some amount of student debt. The Student Loan Company offers 9000 pounds for eligible full time students to pay for their tuition fees. 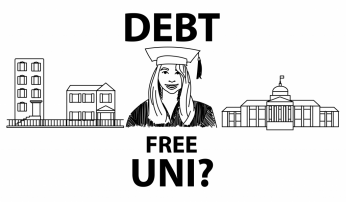 Yet even with tuition fees covered, students will still graduate with other types of debt. Banks and credit card companies prey on student’s tendency to over spend and their inexperience with handling money. You’re given a student bank account with an interest free over draft limit along with a credit card with extended credit. A few pounds here and few pounds there, after only what seems like a few swipes, you’ve reached your limit. Simple – just call the bank to extend your credit limit. Usually they are more than happy to oblige. By the time you graduate your student status is gone and you’ve got to pay back what you owe. Those nights out partying are but just a distant hazy memory. But the debt is real. Once you’re in debt, for many people it’s very difficult to get out of it. Some debt is only cancelled if it has been 30 years since your eligibility to pay has expired, if you are no longer capable of working, or if you are dead. Sounds pretty grim hey. Legislation passed in 2004 prevents student loans from being written off by bankruptcy. Therefore, it is vital to understand how to manage your finances, especially when taking out a loan. If you want to really give yourself a head start you need to try as far as possible to make sure to live within your means and leave university with as little debt as possible. Budgeting – Boring we know but essential. A simple spreadsheet or APP is a great way to understand your money, see what your inflow and outflow of cash actually is. For example: your income is probably broken down into part time work, student loans and very likely an allowance from your parents. Your expenditure is broken down into food, housing, transport, tuition fees, books, leisure and utilities. In an ideal scenario, You’ve also got to set aside some money for emergency funds and paying back loans. If you are spending more money than you are earning, then you’re going to be in debt. At which point you can either increase you inflow: find yourself a better paying job or be cheaky and ask for more allowance. Or you can cut your outflow, spend less on food, ride a bike to school, or switch your mobile phone plan. That holiday to Ibiza may not be in your best interest. The key idea is to live within your means, do not increase your inflow by taking multiple loans or even switching credit card companies in order to fund nights out with friends. Instead, it’s a good idea to both increase inflow of funds and decrease out flow of funds, giving you the best chances of leaving university in a good position to repay your debt or even with no debt at all. Having a good credit rating, managing a solid budget, being disciplined with money and leaving university with little to no debt will allow you to have a head start when you graduate. There are links and resources down in the description to help you get started! Thanks for watching. If you liked this video, please subscribe to our youtube channel, check out our other videos and like us on facebook!